Who’s Been Makin’ Fun of My Mule? Author PseudodionysiusPosted on 2019-02-22 2019-02-23 Categories Movies, Uncategorized26 Comments on Who’s Been Makin’ Fun of My Mule? OK, this is long, but it is funny. It uses action figures to tell a parody of an 80’s Cop Movie. It is dark, gritty, and has NSFW scenes in it. With Action figures. On the RAMU last night, I was amazed to discover that there are people who haven’t seen the 2006 movie Idiocracy. Here are the first couple of minutes which, in opinion, is the best part. Two years before the movie was released, I published my own, much less funny, study, “Global IQ: 1950–2050”, which, based upon U.S. Census Bureau population forecasts for 185 countries around the globe and the IQ measurements and estimates from Lynn and Vanhanen’s IQ and the Wealth of Nations, estimated the mean global IQ at yearly intervals between 1950 and 2050. In short, in 1950 the world had a population of around 2.55 billion with a mean IQ of 91.64. By 2000, population had increased to 6.07 billion with a mean IQ of 89.20. By 2050, the forecast is 9.06 billion and an IQ of 86.32. There is a great deal of uncertainty and possible quibbles with any analysis of this kind. I discuss many of these issues in the document, which provides links to primary data sources. One thing to think about when contemplating this trend and the élites’ notion of “global governance” is that I can find no evidence for sustained consensual self-government in populations with mean IQ less than 90. Would you have liked to be the Last Emperor of China? Thanks to Carol, we viewed our film this week in her lovely suite. She could accommodate nine of us comfortably. This was just as well, as it turned out. The Last Emperor (1987) is an epic film. In Cineplexes, it ran for 160 minutes = 2 hours 40 minutes. The version my Film Group saw ran for 218 minutes = 3 hours 7 minutes. Apparently this version was specially created for TV to run over two nights. We sat through it without anyone stirring, or even suggesting it might be too long. Afterwards, it was suggested that an intermission would have been nice. Obviously, everyone loved it and were fascinated enough to not realize that so much time had passed. It certainly was an epic! A British-Italian biographical drama, the film is about the life of Puyi (1906-1967), the last Emperor of China. The screenplay was written by Mark Peploe and Bernardo Bertolucci, and the film was directed by Bertolucci, the well-known Italian director. John Lone was excellent as Puyi, the last Emperor, as were the rest of the cast in their roles. I was particularly interested in Peter O’Toole and his character as the Scottish diplomat who became the Emperor’s tutor and advisor, Sir Reginal Fleming Johnson, KSMG, CBE (1874-1938). Johnson was also the last British Administrator of Weihaiwei. Peter O’Toole played the part well. I liked the scene in which he wore the Highland Regalia. The Johnson clan doesn’t seem to have a red dress tartan, and O’Toole wore one of the green versions. The green hunting tartans are usually for day wear, and the red dress tartan is for formal occasions. I think it best if I don’t carry that train of thought any further. This is a magnificent film. The historical background to the life of the last Emperor is, of course, the turbulent history of China over that period. It’s amazing that so much was condensed into a film only just under three hours long. What a life Puyi experienced! Born in 1906, as a child, being ruined utterly and allowed to have anything he wanted, including having his eunuchs flogged at his whim. On to being used as a pawn by the Japanese when they invaded China. In 1934, the Japanese crowned him puppet Emperor of Manchukuo, until the Red Army captured him at the end of the Second World War. During the Communist re-education program he finally admitted that he had committed war crimes by collaborating with the Japanese. Considered rehabillitated by the government of the People’s Republic of China, he spent the rest of his life as a gardener, dying in 1967. It certainly made for a fascinating film. At the 60th Academy Awards, the film won all nine Oscars for which it was nominated, including Best Picture and Best Director. Author RedFelinePosted on 2018-11-10 Categories Culture, Movies3 Comments on Would you have liked to be the Last Emperor of China? Would Malcolm appeal to an American Audience? Malcolm (1986) is an Australian cult film comedy, written by the husband-and-wife team, David Parker and Nadia Tass. Nadia Tass also directed the film. Parker and Tass are a team who have won many awards in Australia. Malcolm is a film in a class of its own, and very different. It won the Australian Film Institute Award (AFI) for Best Film, and seven other AFI awards, including Best Script and Best Director. This film shows that the Australian film industry is developing, with it’s own, unique flavour. Colin Friels is outstanding as Malcolm, the tram (street car) enthusiast who becomes involved with a pair of would-be bank robbers. Lindy Davies and John Hargreaves are excellent as that pair. All the gadgets in Malcolm’s house, and the ingenious inventions used in the robbery sequences, were devised by David Parker. They really were a delight, especially the back of a tram used in a get-away. 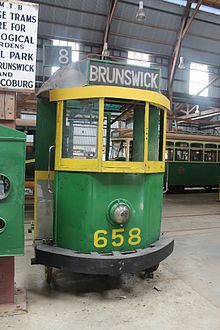 It can be seen at the Tramway Museum Society of Victoria, Australia. Model railway enthusiasts would love the little, model train delivering the mail from the mailbox. Our Group of ten enjoyed the unusual film, and found the humour amusing, aoart from one of our American members, who didn’t really enjoy the film too much, as she didn’t find it funny. She is used to American humour, which is different. It’s intriguing that humour differs subtly between cultures. On a raised-with-difficulty budget of A$1 million, at the box office Malcolm raised A$3,842,129. Author RedFelinePosted on 2018-11-01 Categories Culture, Movies2 Comments on Would Malcolm appeal to an American Audience? Canadian writer, Alice Munro won the Nobel Prize in Literature in 2013, for her short-story writing. This is the first time ever it has been given for anything other than literature: never for short stories. This month Kalpna Deepak chose to have our Group read as many of Alice Munro’s short stories as we liked. Kalpna is enthusiastic in her appreciation of Munro’s work, and gave us a highly educational presentation for our session this month. Kalpna began by discussing Alice Ann Munro’s life. She was born in 1931, in Wingham, Ontario, little more than a village at that time. Her stories are built around life in such a small community, although she does mention Toronto from time to time, as being the “big city” in a different world. Kalpna, who is from Delhi, India, said that she related to the stories because they remind her of the small Indian village of her grandparents, which she visited from time to time when she was a child. What struck Kalpna is that human nature is the same in those two small places; so far apart, so different, yet so alike on the level of human interaction. When Kalpna spoke of Munro’s work she mentioned the different aspects that appealed to her. The humour displayed by Munro in her writings, amused her. Munro also shows a great empathy for the subjects of her stories. A deep understanding of human nature is necessary to write with such courage and honesty about life as it truly is, not romanticized or fantasized. This gives the stories a universality that appealed to Kalpna greatly. This is what makes Munro’s writing great. In the discussion that followed, many of us said they like the work of Alice Munro, but others of us mentioned that they had found the stories a little dull. Kalpna did admit that she has had 10 years of education in literature, so she is approaching the stories from a particular viewpoint. Alice Munro says herself that her stories are the way things happen, not why they happen. This means that they are not action pieces, but written to provoke thought as to what life is about. Kalpna certainly increased our understanding of the work of Alice Munro. Now, when we read her short stories, we will do so from a different, much deeper perspective. She also showed that to appreciate a work of literature, it is necessary to know about the writer and from where the author is coming. There are many facets to the writing, such as those Kalpna pointed out, that can be noted. This background knowledge helps put the work into perspective, and increases our enjoyment. When I rose to thank Kalpna, I only got as far as doing just that, then was stopped by the standing ovation from our Group. We had all enjoyed a delightful afternoon! Author RedFelinePosted on 2018-10-25 Categories Culture, Movies4 Comments on Do you like short stories? Finding Neverland (2004) is a historical fantasy drama, based on the play The Man Who Was Peter Pan (1998). The film is about Scottish playwright J.M. Barrie and his relationship with a friendly family which inspired him to create Peter Pan. Directed masterfully by Marc Forster, the screenplay is well-adapted by David Magee from the play. The music score is delightful, and the cinematography is lovely, evoking the Edwardian era into which the story is set. Johnny Depp well deserved the Best Actor Award he won for his portrayal of J.M. Barrie. I particularly appreciated his educated Scottish accent, which was not overdone as it so easily can be. As a fan of Johnny Depp, my admiration of his work increased with his sensitive treatment of J.M. Barrie. He captured the gentle personality, and imaginative mind of Barrie perfectly, and appreciated that Barrie was a unique character. All this he showed with a master’s delicate touch. Kate Winslet played Sylvia Llewelyn Davies, the mother of the boys of the friendly family, well. I enjoyed Dustin Hoffman as Charles Frohman and Julie Christie as Mrs. Emma du Maurier, Sylvia’s mother. The story of Peter Pan, and the Lost Boys is delightful, and although seemingly written for children, carries so many truths that adults can appreciate, it strikes a chord with older people. Like most people, I had read the story as a child, and loved it. It was such a pleasure to understand how it had been created, and to learn more of James Matthew Barrie, who had written it. The film earned several nominations at the 77th Academy Awards, including Best Picture, Best Adapted Screenplay and Best Actor for Johnny Depp. It won for Best Original Score. It did well at the box office, making $116.8 million USD for a budget of $25 million USD. The Great Gatsby (1974) is based on the book by the same name (1925) by F. Scott Fitzgerald. The book is set in Long Island, in 1922, and is considered a masterpiece: beautiful use of the English language; strong characterizations; evocative creation of the place and times of the Roaring Twenties; strong messages full of symbolism. The story is around obsession with an image of the “good life”, the “American Dream”, and how that image is so flawed, and in the end so destructive. Gatsby is obsessed by his image of Daisy, who tells him that rich girls don’t marry poor boys. His obsession drives him to become materially rich, although emotionally so poor, and in the end his obsession leads to his death. This film recreation of the book can be said to look beautiful. The direction by Jack Clayton is professional ; the screenplay by Francis Ford Coppola is true to the voice of Fitzgerald; the cinematography conveys the mood of those times; the costumes are perfect; the music is lovely: altogether a gripping experience. My Film Group and I sat through the almost two and a half hours enthralled. Robert Redford plays Jay Gatsby adequately, as does Mia Farrow the part of Daisy Buchanan. Beyond that it is difficult to go. The director could surely have used their talents better. We don’t feel any chemistry between them, and it is difficult to know why Gatsby is so obsessed by such a shallow, self-absorbed person as Daisy. Sam Waterston gives a good performance as Nick Carraway, the narrator of the story, but seems objective in his telling. Bruce Dern as Tom Buchanan is the only character who seems to have some life about him. In the book, we felt for the characters; in the film we didn’t feel anything for them at all. They seemed like cardboard mannequins going through the motions. The audience is left feeling let down. The film is such a visual and musical feast, yet we are emotionally so untouched. What a pity! The film did well at the box office. It took in $26.5 million USD for a budget of $7 million USD. Author RedFelinePosted on 2018-10-19 2018-10-20 Categories Culture, Movies21 Comments on What did you think of The Great Gatsby? The film Gosnell:The Trial of America’s Biggest Serial Killer was released about a week ago. It was produced by documentarians Phelim McAleer, Ann McElhinney, and Magdalena Segieda, though this film is not a documentary. This is not a film I would normally see but made an exception in this case because I (slightly) know the filmmakers. They had invited me to the L.A. premier last week but I could not attend. Surprisingly, the film is being shown in several theaters in my area, which is where I finally saw it – surprising because it was independently released and the producers faced a lot of hostility from Hollywood. The film is about Kermit Gosnell, a physician who operated an abortion clinic in Philadelphia for several decades. He was convicted on murder in the first degree of three infants, manslaughter of an adult patient, and numerous other felonies. Aside from these major offenses, he operated his clinic in a grossly unsanitary manner and used unqualified individuals as medical personnel. The story was given national prominence through the persistent efforts of our own Mollie Hemingway. The film takes the artistic license of replacing nationally known and serious journalist Mollie with a local and unknown (presumably fictional) blogger Molly Mullaney. In a recent interview on the Ricochet flagship podcast, Mollie said she cried though much of the film. I had a somewhat different response: disgust, anger, and a frequent desire to avert my eyes. It’s not that many graphic images are shown; the film is rated PG-13. The writers were so adept at enhancing the images with words that one’s imagination did the rest. This film is well made, with excellent actors and high production values: a significant step up from their previous work. Andrew Klavan also has a writing credit. I hesitate to recommend the film because of the nature of the subject matter. It’s not for everyone. If you’re into this sort of thing, it is a compelling movie that you will think about long after leaving the theater. Like Water for Chocolate (1992) is a Mexican film directed by Alfonso Arau. The screenplay was written by Laura Esquivel, the author of the book on which the film is based (1989). The style of the film is termed magic realism. This is often used to convey ideas about changes that should be made to traditions and social structures within a society. It contains magical happenings that are treated as if they are a normal part of real life. Even without knowing this, the film is beautiful in its own right. Magic Realism is often considered an art form, and this film is Art. The changes being made in society around the place of women in society is the main theme of this film. Tita, the main character in the story, throws off family tradition and creates her own life, as does her sister, Gertrudis. Her oldest sister, Rosaura, follows the traditions of her family and society, and in the end this destroys her. I found it interesting that when Tita and Pedro, her lover, come together, the consummation is too much for Pedro, and he dies of a heart attack. Tita poisons herself by eating matches. The house catches fire, and all is consumed, except Tita’s cook book, which is passed down to her grand-daughter. This could be symbolic of how great is the disruption to the old way of life the new ideas bring. It deeply affects Tita and Pedro, who are part of the change, but the new way becomes accepted and brings happiness to the younger women affected by it. The film is full of symbolism, and is certainly thought-provoking. My film group enjoyed the film, and we had an interesting discussion around the main theme. The thought was expressed that it would be good to watch it for a second time, as there is so much in the story it was difficult to understand it all with just one viewing. The film became the higest-grossing Spanish-language film ever released in the United States at that time. It grossed $21.6 million USD. Did you see Tea With Mussolini? Tea with Mussolini (1999) is a semi-autobiographical film directed by Franco Zeffirelli, telling the story of a young Italian boy’s upbringing by a group of British women before and during the Second World War. Zeffirelli’s own story began in a similar manner. He created the story for the film, and the screenplay was written by John Mortimer. A young boy, Luca, is adopted by a group of British ladies in Florence. The atmosphere in Florence in 1935 is recreated. We experience the fear felt by the expatriate community when the Fascists attack the restaurant where they are having afternoon tea. Lady Hester Random, the snobbish widow of the former British ambassador to Italy, believes she has the favour of Benito Mussolini, and visits him. She receives his assurances that the ladies are in no danger. Naively, she believes him, and talks proudly of her “tea with Mussolini.” In spite of her confidence, when Italy declares war on Britain, the ladies are rounded up and taken off to Gimignano, Tuscany, as enemies. An American lady, Elsa Morganthal Strauss-Armistan, a rich American socialite, funds the move of the ladies to a high-class hotel. Lady Hestor thinks it is Mussolini who is looking after them. She has always been horrible to Elsa, looking down on all Americans. Luca helps Elsa achieve her plans for the ladies. When the United States enters the war in 1941, the American ladies are interned with the British. Lady Hestor discovers that it is Elsa who has helped them. She and Luca help Elsa, who is Jewish, flee Italy, and escape to America. We are told at the end of the film that Luca is an artist who is involved in the making of this film. In other words, the writer and director, Zeffirelli. The film has a highly distinguished cast: Dame Joan Plowright is Mary Wallace; Dame Maggie Smith is Lady Hestor Random; Dame Judi Dench is Arabella; Cher is Elsa; and Lily Tomlin is Georgina, another American expatriate. No more needs to be said about the quality of the acting. The film won British Academy of Film and Television Arts (BAFTA) awards for best makeup and hairstying. Never have I seen such a beautiful marcel wave as that displayed by Lady Hestor. It really was incredible. Marcel waving is done with a hot marcel wave curling iron, and is difficult to do. My film group settled down with our wine and chips, and thoroughly enjoyed this film. There is little more that needs to be said. Audiences agreed with us, and with a budget of $12 million USD, the box office was $45,566,200 in the United States alone. Author RedFelinePosted on 2018-09-28 Categories Culture, Movies4 Comments on Did you see Tea With Mussolini? Do you remember Goodbye Girl? The Goodbye Girl (1977) is an American romantic comedy, written by Neil Simon. It’s a fun movie, with witty dialogue. My Film Group enjoyed the film. Directed by Herbert Ross, the film is highly professional in every way. Richard Dreyfuss is delightful as Elliot Garfield, Marsha Mason is fairly attractive as Paula McFadden, the Goodbye Girl whom her husband divorced and her latest man friend has just abandoned. She seems such a shrew at the beginning of the movie, it hardly seemed surprising that men were saying goodbye to her. She was allowed to improve as the plot developed. Quinn Cummings deserves a mention as Lucy McFadden, Paula’s daughter. After an inauspicious beginning to their relationship, Paula falls for Elliot. Lucy also become attached to him. He has to leave for four weeks to go to Seattle on a job he can’t possibly refuse. He makes it quite clear to Paula that he will definitely be coming back, so the film ends happily and the audience is left feeling good. Neil Simon’s script is almost too wordy, and with too many one-liners. It almost felt a strain trying to keep up with the dialogue. On the other hand, Dreyfuss playing Richard III as a homosexual, is one of the funniest renditions I have ever seen. At the 50th Academy Awards, Richard Dreyfuss won the Oscar for Best Actor for his work. Nominations: Best Picture, Ray Stark; Best Actress, Marsha Mason; Best Supporting Actress, Quinn Cummings; Best Screenplay, Neil Simon. At the Golden Globes, the film won: Best Picture; Best Actor; Best Actress; Best Screenplay. Audiences voted with their money, and the Box Office was $102 million USD. Author RedFelinePosted on 2018-09-20 2018-09-20 Categories Movies18 Comments on Do you remember Goodbye Girl?